Your mortgage should lend itself around your life – not the other way around. 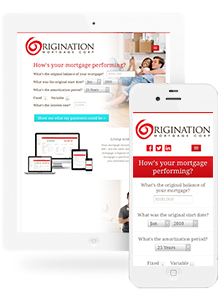 Origination software allows users to enter there mortgages details and see instant performance graphs on how their mortgage is performing. The fully responsive website and software allows users to send instant messages to their advisors (realtor's, lawyers) along with their originator (broker). 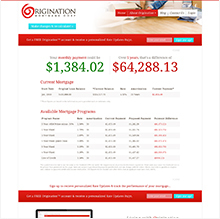 The system keeps users updated with the latest mortgage trends and is poised to be next be SaaS for mortgages. 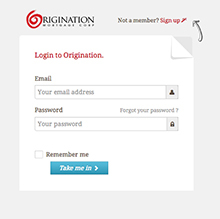 Origination is truly in a league of its own with its social, document management, instant chat, rich data sets and user experience. 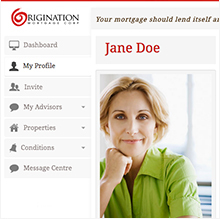 Enter your current mortgage details and get instant feedback on how you can save. Sign up with an email and password. System walks you through the rest step by step. Everyone involved with your mortgage is at your finger tips. 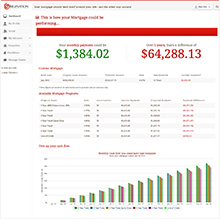 Rich data sets giving instant insights on your mortgage and how to optimize it.